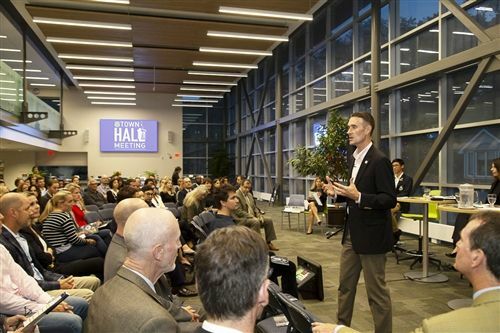 The student experience, Crescent’s strategic academic plan and the master campus plan were the hot topics at our third annual Town Hall meeting on September 25, 2018. Over 150 parents and alumni came to hear Headmaster Michael Fellin and members of his executive team discuss matters of strategic significance to the school. In a Town Hall first, Head Boy Kyle Chang added a student voice to the evening. Kyle spoke about the many initiatives already underway by the 17 student leaders on his Prefect team. Their efforts are guided by the 2018-2019 student motto: Once a Brother Never Alone. Heads of School Dr. Sandra Boyes and Nick Kovacs addressed the five components of Crescent’s strategic academic plan which articulates what makes a Crescent education unique. These concepts have been packaged in a brochure entitled The Crescent Way that was shared with the audience. Implementation of the academic plan began this year with the new master schedule and student assessment protocol. The rollout of the plan continues through 2022. Carolyn Smith-Green, Chief Financial and Administrative Officer, updated the audience on the master campus plan. Concept and design development are underway following last year’s research, discovery and community input phases. These concepts will be confirmed through a feasibility study and brought forward in an open house planned for 2019. The Crescent Report Card 2017-2018 was unveiled at the Town Hall. This compendium of strategic accomplishments and department highlights celebrates the great work taking place at the school.